Connecting the Dots: Health, Education, Economics and Politics in Rural Georgia. 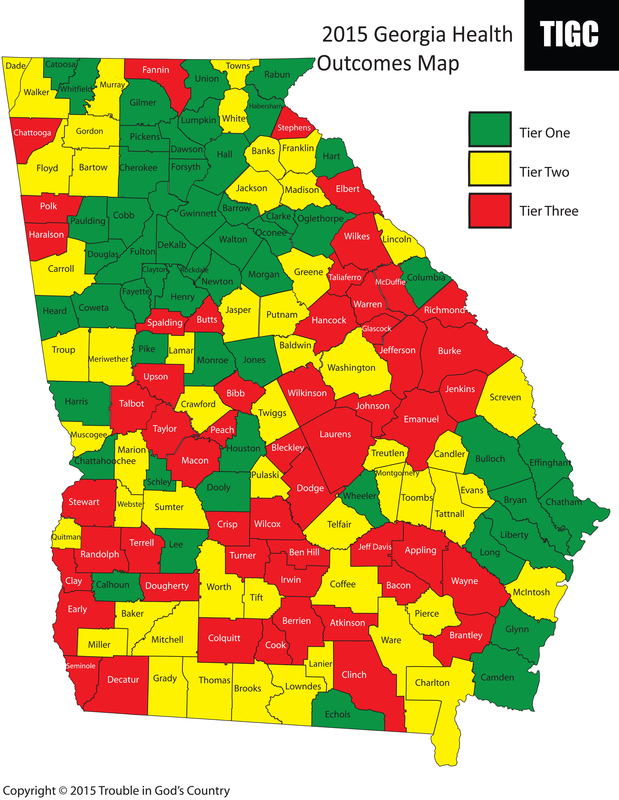 With the publication Wednesday of the Robert Wood Johnson Foundation’s 2015 County Health Rankings, we can indeed report that, as expected, Forsyth County has slipped past perennial leader Oconee County and claimed 1st place in the 2015 Trouble in God’s Country Power Ratings. 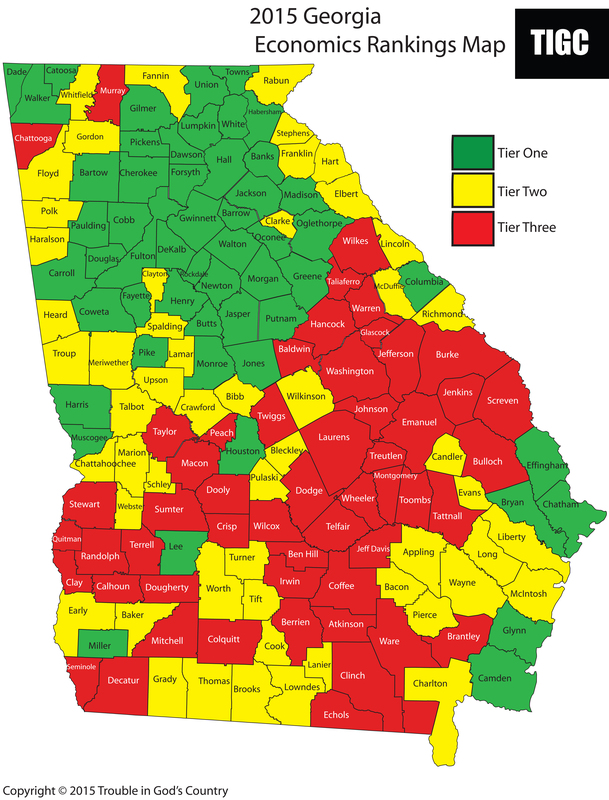 Oconee County slipped to 2nd place in the overall Power Ratings. It had held 1st place for the first five years on the strength of the top economic ranking and a strong showing in the health category as well. Over the past couple of years, however, its health outcomes ranking had slipped a notch or two, and this year it fell to 2nd place in the economic rankings as well. Its overall Power Rating slipped to 3.5. Rounding out the top five counties were Fayette, Columbia and Cherokee counties. Jefferson County landed at the bottom of the heap in this year’s Power Ratings. It ranked 156th for economics and 148th for health outcomes. The other counties in the bottom five were Taliaferro, Crisp, Atkinson and Warren. To view a complete list of counties, sorted by their Power Rating, and providing their economic and health rankings, click here. 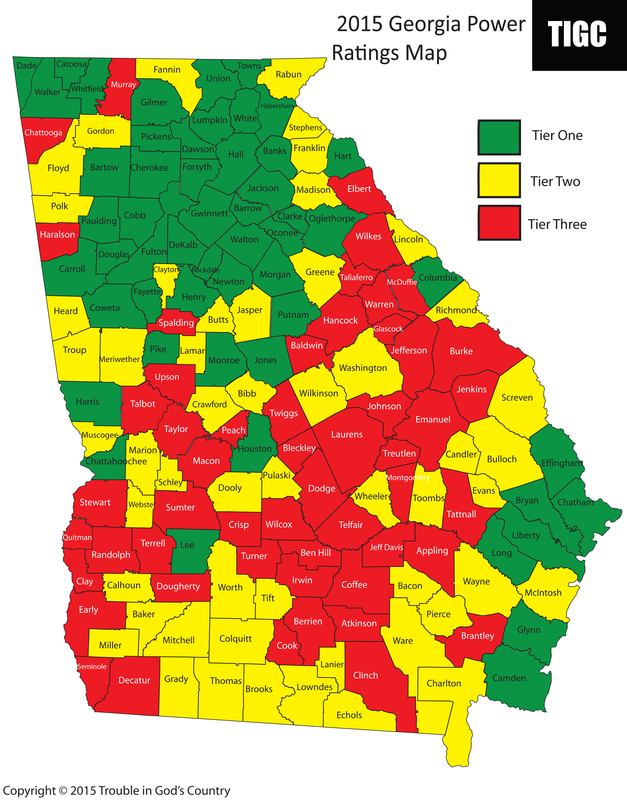 To zoom in on the 2015 Georgia Economic Rankings Map, click here. To zoom in on the 2015 Health Outcomes Map, click here. To zoom in on the 2015 Power Ratings Map, click here. ← A new Power Ratings champ? Trump says America is ‘FULL.’ Tell that to Rural Georgia. R.I.P., House Bill 887. We hardly knew ye.